The Travelling Lindfields: Zebedee Springs and Chamberlain Gorge: Disappointment in The Kimberley. 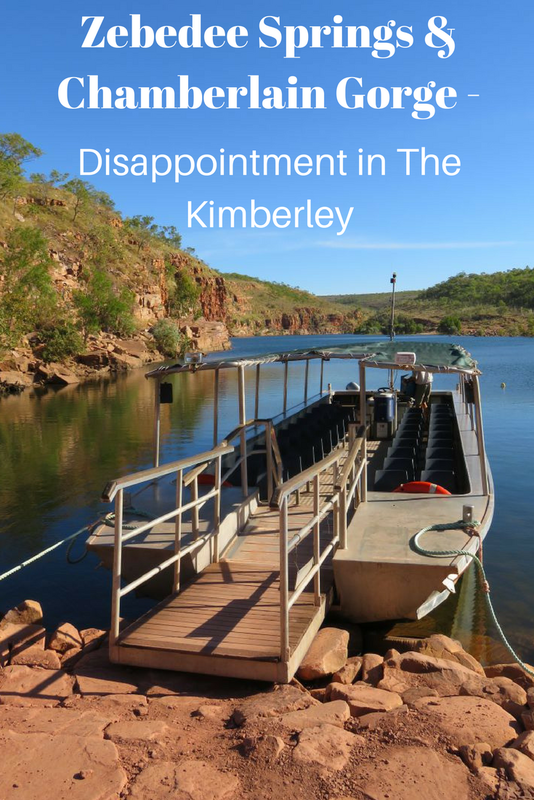 Zebedee Springs and Chamberlain Gorge: Disappointment in The Kimberley. Even on the best trips it is inevitable that at least one thing won't quite live up to expectations. On our recent trip to the Kimberley in Western Australia, there were two: Zebedee Springs and Chamberlain Gorge. Zebedee Springs because, to quote my mother-in-law, the world and his wife were there, and Chamberlain Gorge because it was Chamberlain Gorge and not where we set out to go - Explosion Hole. 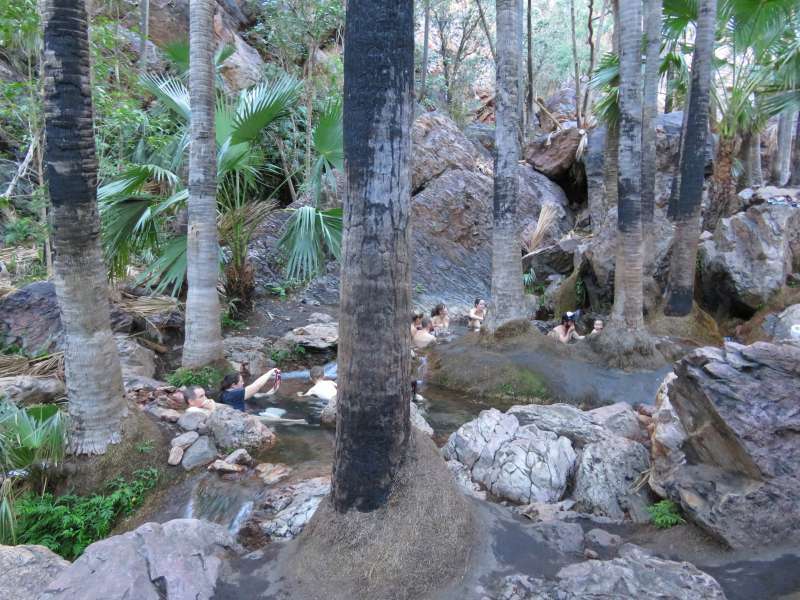 The guide books will tell you that Zebedee Springs is a series of natural thermal rock pools set at the base of a sheer cliff and surrounded by livistonia palms - literally an oasis in the wilderness. Sounds lovely doesn't it and I am sure it was - once! Sadly, Zebedee Springs has been discovered. 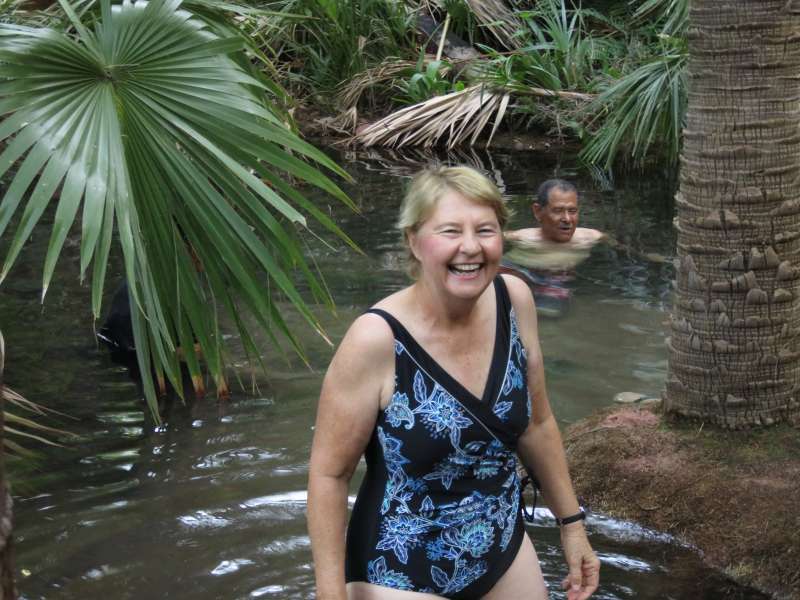 The reality is that Zebedee Springs is an over-crowded series of natural thermal rock pools set at the base of a sheer cliff and surrounded by livistonia palms. Zebedee Springs - as the guide books would have you believe it is. We arrived just after 8 a.m., having been forewarned about the crowds. David is not one of the early-risers of this world and getting him to anything before about 10 a.m. is a herculean task, so I was pretty pleased with 8. Even so there was a conga line of tourists ahead of us weaving their way along the path from the car park and an even longer line of hopefuls waiting for the chance to use the toilets as a change shed. Fortunately, I had my swimming costume on underneath my clothes. Once we arrived at the rock pools it was a toss-up as to what was most difficult: finding a way to enter the pools safely without slipping on the moss-covered rocks or squeezing in beside the other early arrivals without intruding unduly on their personal patch of 'solitude'. After ten minutes soaking in the pleasantly warm water, I'd had enough. It didn't help that David doesn't swim unless he is forced to, so he stayed on the bank while I, and ten thousand other tourists, had the pools to ourselves. Zebedee Springs - in reality! Would I recommend a trip to Zebedee Springs? Yes, but with reservations. You could try arriving at 7 a.m. when the springs open but I doubt it would make a lot of difference. The tour operators seem to have discovered that one, with several groups already leaving as we arrived. You can see from the expression on my face that it wasn't all bad! Zebedee Springs is open from 7 a.m. to 12 noon. It is closed to the general public in the afternoons. If you want to visit after midday you need to join an El Questro tour. 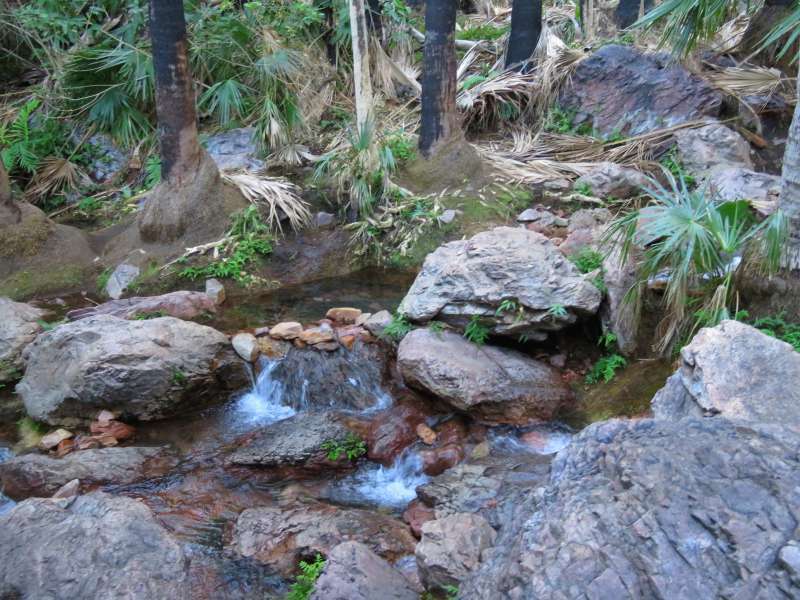 The springs are about one and a half hour's drive from Kununurra along the El Questro Road which turns off from the beginning of the Gibb River Road. 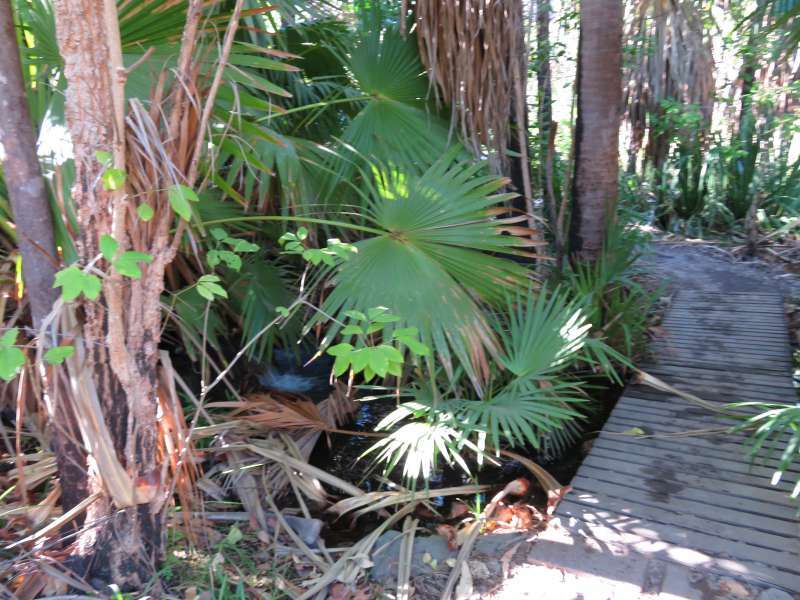 It is about 15 minutes from El Questro Station. You will need to purchase an El Questro Wilderness Park Permit. A day pass costs $12 per adult. Children 12 and under are free. El Questro Road is a corrugated dirt road. A 4WD vehicle is highly recommended. The path from the car park to the springs is an easy 1 km walk along a well-marked trail. The path leading to the springs. It became a dirt path as we got closer but it was still very easy to negotiate. We trawled the internet, asked the locals and generally did our homework. Everyone recommended we see Explosion Hole. We booked a tour departing from El Questro Station in the afternoon of the last day of our stay. The tours for the other days were already full or clashed with other things we wanted to do. Sadly, the travel Gods were against us. "Are we in the right spot for the Explosion Hole tour?" This was not quite the answer I was hoping for. "The Safari truck has lost an axle. The tour has been cancelled." Neither David nor I could understand how in a place where there were more 4WDs than we had ever seen before in our lives she couldn't have located a back-up vehicle. As it turned out, this was the back-up vehicle. The main vehicle had broken an axle the previous day. In case you were wondering, this might give you some idea of just how rough some of the 'roads' in this part of the country are. The guide, a pleasant young girl in her early twenties, was quick to apologise and to offer us a spot on the next day's tour. Unfortunately, we had an early flight to Broome so that wasn't going to work. There was nothing for it but to switch to the Chamberlain Gorge tour, a much more family oriented and sedate experience. At least she gave us complimentary tickets. The red-rock sides of the gorge were lovely but they had nothing on the gorge at Berkeley River. We were joined on the tour by the old, the infirm, the families with young children, the non-adventurous and the other disappointed Explosion Hole hopefuls. 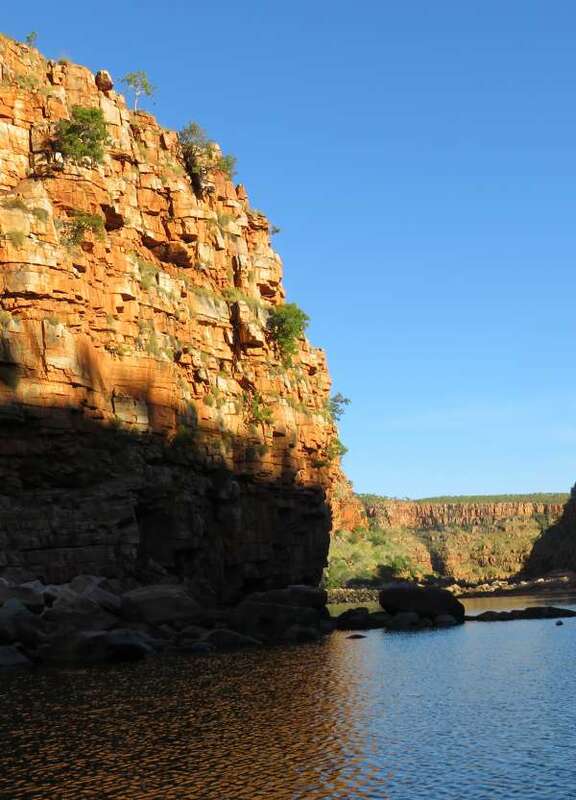 Chamberlain Gorge is a 3 km long fresh waterhole not far from El Questo Station. You could sail to the end of it in 10 or 15 minutes. To fill in the rest of the two hour's tour time we were served fruit and wine and shown how to feed the local fish. Our tour boat waiting to take us into Chamberlain Gorge. Archerfish prey on insects and small animals by knocking them off overhanging leaves and branches with a jet of water expelled from their mouths. The can shoot a projectile of water up to 3 m. On board the tour boat we were each given a handful of pellets and told to reach out over the water with a pellet between our thumb and forefinger. We soon had a school of archerfish competing to shoot the pellets down. They had a way of looking directly at each pellet just before they shot so you could see you were about to get spat at. Archerfish - I didn't even try to get a photo of one spitting. I am not that good a photographer. The feeding frenzy attracted other fish as well - schools of catfish and several large barramundi. Our guide and a couple of the other tourists took turns hand feeding the barramundi. I quite like having all ten of my fingers and thumbs, so I gave that activity the miss. Chamberlain Gorge is just past El Questro Station on El Questro Road which turns off the Gibb River Road. It is about ninety minutes by 4WD from Kununurra. You will need to purchase an El Questro Wilderness Park Permit. A day pass costs $12 per adult. Children 12 and under are free. You can drive to the start of the gorge, provided you have a high clearance 4WD, but to see more than that you have to join a tour. This is a great tour for anyone with mobility issues or if you have young children with you. It is calm, sedate and requires no walking. Book the tour ahead of time if you can. Our boat was full. Do the Explosion Gorge tour instead. It is three times the price but promised to be much more exciting. The springs do look nice. Sorry to hear about the crowds. I would be disappointed too. You win some and you lose some. I am glad we went but if would have been much nicer if we had had it to ourselves. I get the impression that driving the Gibb River Road has become something of a right of passage for retirees. David is not a camper but we were able to dip our toes in the Kimberley by visiting the bits we could get to easily from Kununurra. Tell your wannabe biologist, I envy her passion. The archerfish were great fun, just not quite what we set out to see. Still, it would be really boring if everything were to happen the way we expect it to. It's always interesting - and useful - to read about disappointing travel experiences as well as the ones that take our breath away. Thanks for telling us about the touristy springs on #FarawayFiles. I'll remember to avoid that if I visit the Kimberley. It is still probably worth going - just arrive early and don't expect to have the place to your self. Lyn you make me laugh out loud. Yes I'm quite keen on having 10 fingers too. 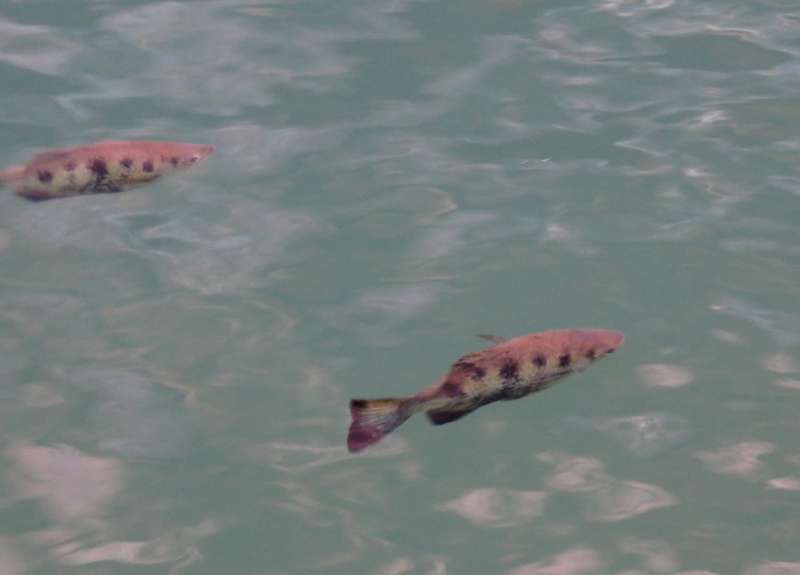 Fish that can spit water 3m? Only in Australia. You have all the best animals! Although we add to the throngs of tourists with our own presence, my tolerance for crowds is dwindling substantially. More and more being off the beaten track appeals to me. By the smile on your face it looks like you made the best of it. I secretly enjoyed Zebedee Springs but shhh! - don't tell anyone. Remember when you came to Australia and you didn't see kangaroos in the bush. David and I are on the Gold Coast in south-east Queensland and 10 minutes from the ultimate crazy high-rise city (think Las Vegas on steroids) is an area with literally hundreds of wild kangaroos. It was fantastic. I am about to put some of the photos up on Facebook. p.s We are planning a trip to Newfoundland the year after next. The main reason is to go somewhere everyone else has yet to 'discover' - you watch some Hollywood guy will make a GOT spin-off set there and we will find ourselves in tourist central. I don't think you can visit Zebedee Springs, or indeed most of the Kimberley region, off season. The wet is so torrential that the roads become unpassable. We thought about doing the afternoon 'El Questro' tour but the guide who we spoke to said that it was better to go on our own because at least then we could take our time. The springs are quite small so I don't think you would have to be in a very big group for them to be overwhelmed. Such a shame that somewhere so beautiful is so crowded and takes away from the pleasure of enjoying it! That's so crazy that by 7am tour groups are already arriving! But glad you were able to still enjoy it! Thanks for linking up with #TheWeeklyPostcard! The 7 a.m thing also relates to the weather. Even in winter the days can get very warm and so there are advantages in seeing things early, or later in the afternoon. Sometimes the travel star just don't align. I'm glad I'm old enough to have made it to some of the world's great places before they were completely discovered---like Machu Picchu for our 1982 honeymoon when there was only 1 hotel there. Explosion Gorge does sound exciting although I've learned that roads that regularly take out car/jeep axles can also be kind of tough on the human body---especially those with old bones as mine has become. 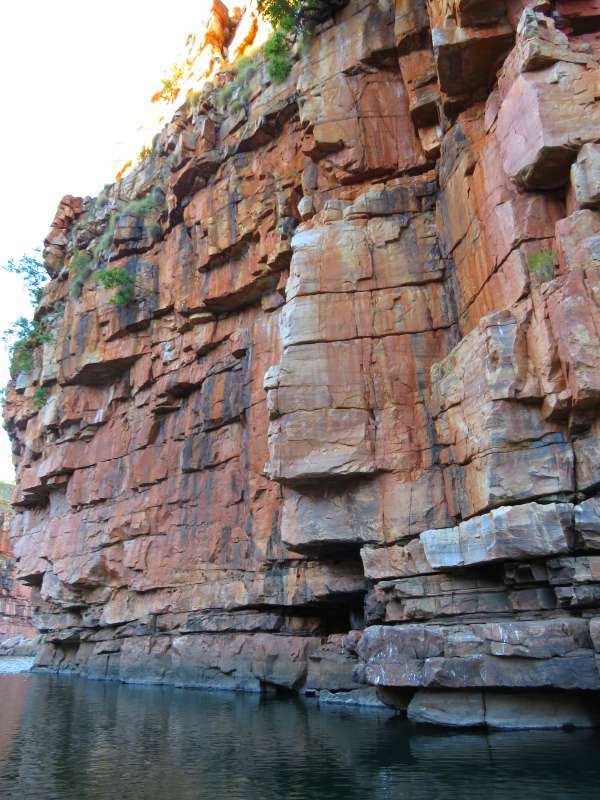 The Kimberley generally is still remote and untouched. I just have to work out a way to see the bits which aren't so easy to get to. I was quite looking forward to the bone jarring road but I do take your point. It's always a pity when you get somewhere and find it so crowded - I suppose once people get to know about a place it's bound to attract a lot of visitors. That's why I spend so much time trying to find places that aren't in the guidebooks! It was still enjoyable, although I agree with you about getting off the beaten path where it is possible. Loved the expression, "The World and his wife were there" which I guess sums up your experience. I hate crowds but they seem to be a price you have to pay when visiting the tourist hot spots. And I know I wouldn't be wanting to get up any earlier to bathe in a thermal pool!🙂 The archerfish are fascinating but it sounds like they still didn't make up to the disappointment of missing Explosion Hole. Hopefully, there's a next time! I am already planning a return to the Kimberley and seeing Explosion Hole will be near the top of the list. 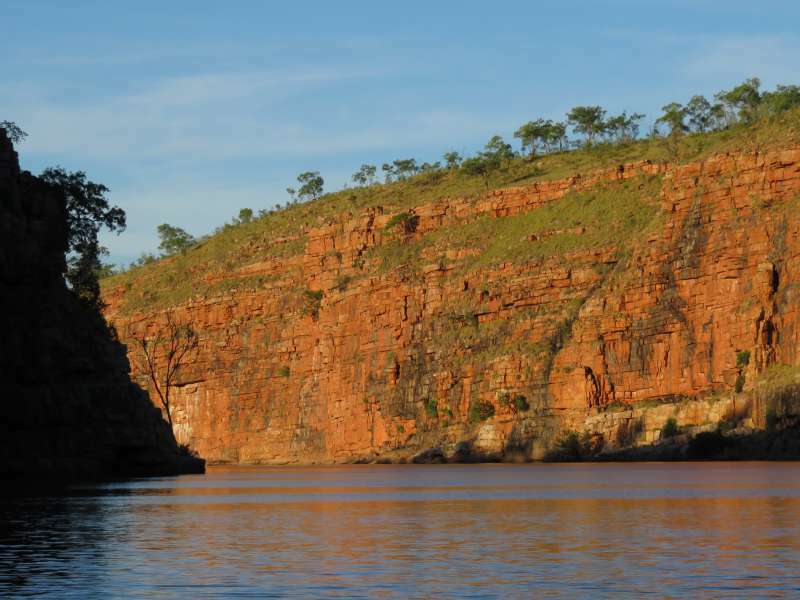 In the end though the Kimberley is so stunning that missing one attraction isn't a big issue. Sorry it was so disappointing. If you travel as much as we both do, these things are bound to happen at some point. It's good to share it so other's know the truth. Thanks Lyn! David and I have an expression 'you pay your money, and you take your chances'. Basically it means that sometimes you get lucky and sometimes you don't. Overall I loved the Kimberley so a couple of less than perfect side-trips weren't a big issue. 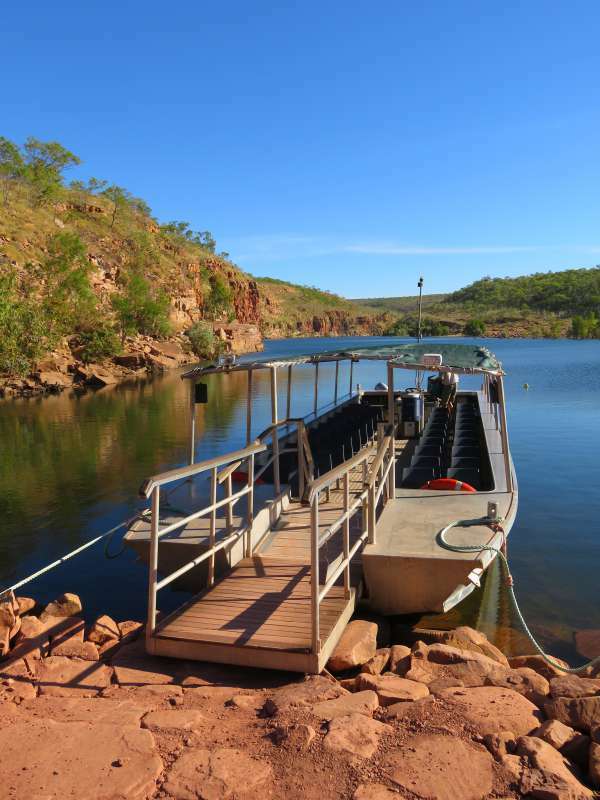 Zebedee Springs and Chamberlain Gorge are two of the easiest parts of the Kimberley to get to. I am sure that if you are more adventurous than us there are lots of stunning sights which are as yet untouched. The tour switch was very disappointing because we especially wanted to see Explosion Hole but there was very little El Questro could do about it. If it hadn't been our last day they would have happily put us on the next day's tour. Isn't it annoying when a guide book portrays a picture of one place, yet the reality is different! Who would have thought there are so many tourists in the remote Kimberlys. It's a shame the car broke down and you weren't able to do the tour you wanted to. I hope you got a refund at least! The cheaper tour wouldn't compensate something like this!